Leading Manufacturer and Exporter from Surat, Our firm specialises in offering a distinct collection of attractive Printed Saree . In accordance with the latest market trends, Georgette saree, Special Collection Party Wear Sarees, Modern Fancy Design Sarees, Party Wear Saree, wedding wear saree. 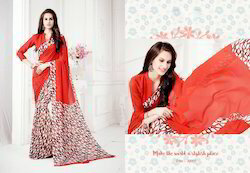 Occasional saree, attractive color saree. Our offered are well-known in the market for featuring variegated attributes like fade resistance, perfect finish, to name only a few. Be a part of any casual event wearing this Blue Faux Georgette Saree and Blue Printed Saree. 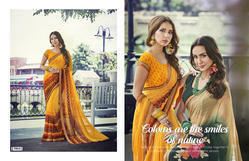 This Designer Sarees ensemble is beautified with Geometric Print, Lace and Patch Border Work. As shown, a balck and Blue Art Silk Geometric Patch work Blouse in Unstitched form accompanies it. Full Set : 22 Pcs.